Research shows that a home without an alarm is 2-3 times more likely to be burgled. Home owners often leave valuables in visibility of passers by, which can dramatically increase the chances of being burgled. Research also shows the highest percentage of items commonly stolen are electrical goods, making up over 60% of the most common items burgled, yet these are the most likely to be left on display. 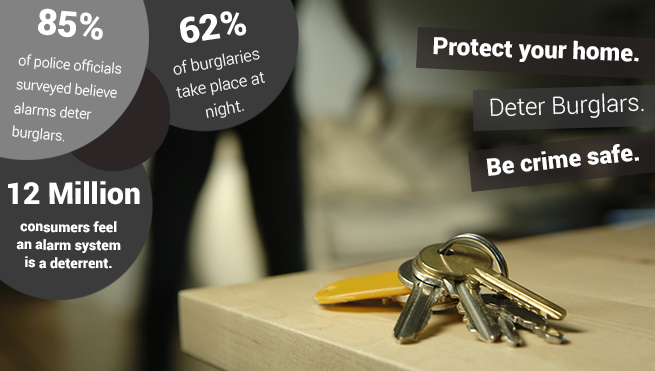 62% of burglaries occur at night and 52% of homeowners make the common mistake of leaving spare keys by their entrance, within easy reach of a burglar. Over 80% of police officials who took part in a recent survey, believe that alarms deter burglars. 12 million consumers are reassured when installing a burglar alarm, feeling that a burglar alarm is a good deterrent. It is also proven that burglars bypass houses that require effort, and look for easy options. Making an alarm a fantastic deterrent. There are a number of easy fit alarm ranges, designed with the consumer in mind, many taking just a few minutes to install and in the long run making your home 60% safer. Ranges include Easy Fit SmartPhone Alarm systems, which can be operated from your iphone/android phone or even your website browser. This amazing system will use a trigger from the alarm, take an image of the room which set of the alarm and send it directly to you so you can see the cause. The mere fact that your home has a burglar alarm installed is proven to deter burglars buy over 60%. Not only this but knowing your home is safe and secure from break ins, can increase your peace of mind. Many insurance companies offer discount for homeowners who have an alarm system installed in their home. Take a look at the suppliers above for more information on securing your home.